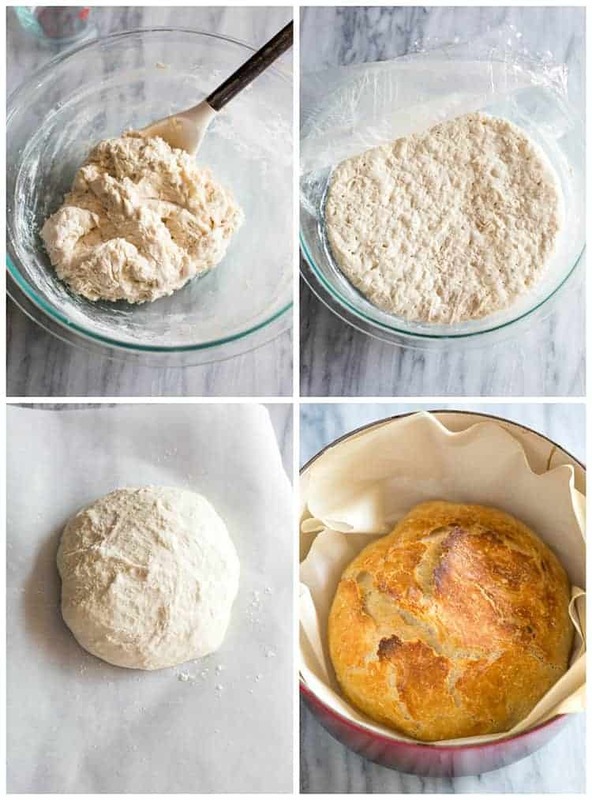 A step-by-step tutorial for making No Knead Bread. 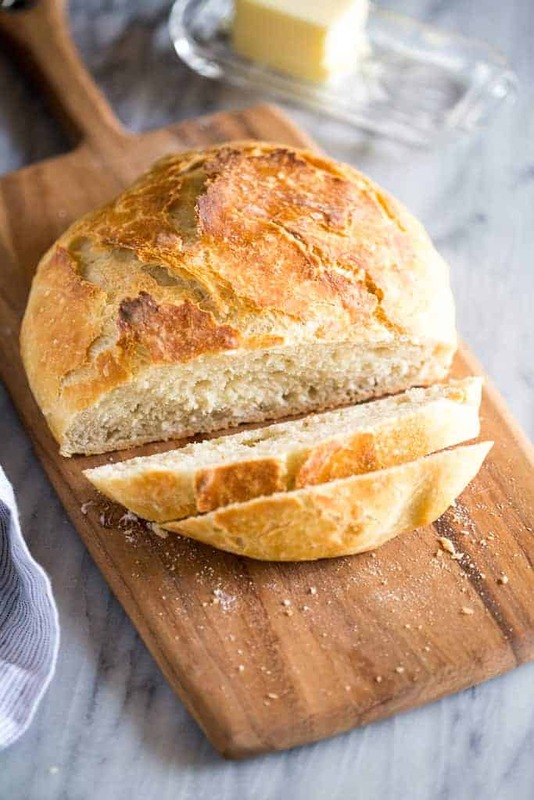 This quick and easy bread dough recipe has just four ingredients and makes homemade artisan bread without kneading! Nothing beats the smell of homemade bread! 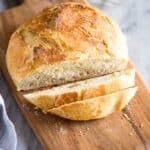 It will amaze you how quick and easy it is to make this No Knead Bread and you can make the bread dough without any special tools!! My other favorite bread recipes include Honey Whole Wheat Bread and Easy Banana Bread. I have included some variations for making this No Knead Artisan Bread. You can make the bread dough even healthier by using whole wheat flour (see directions below) or add a variety of different flavors to the bread dough. You can also choose to cook the no knead bread dough on a baking sheet or in a cast iron pan! 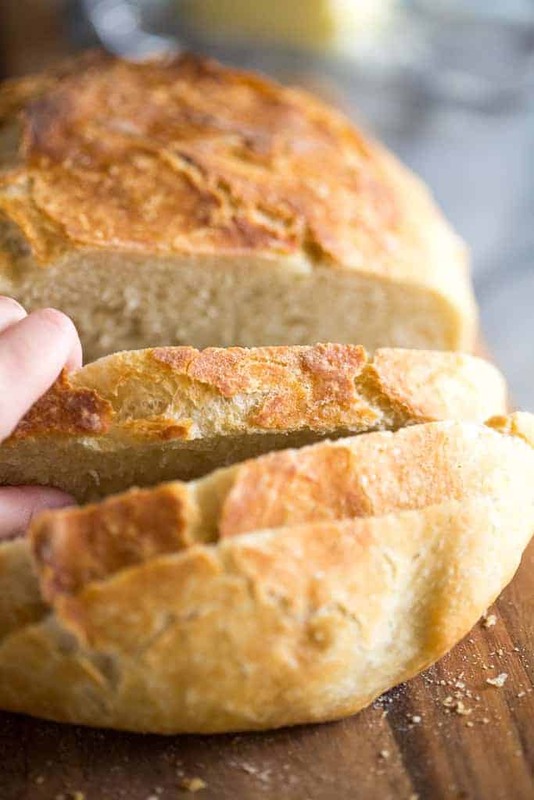 No matter which No Knead Bread variation you choose, you will find that there is no kneading required to make this bread dough recipe. It’s hard to believe, I know, but I’m confidant that you’ll be “wowed” by this amazing and simple recipe! In a large mixing bowl, combine flour, salt and yeast. Add warm water and stir with a wooden spoon until combined. Cover the bowl with plastic wrap and allow to rise on your counter, at room temperature, for 12 – 18 hours. Once dough has risen, shape it into a ball and cover lightly with plastic wrap. Place an empty cast iron pot, with the lid on, into the preheated oven for 30 minutes. Remove pot from the oven and place the dough ball, still on the parchment paper, into the hot pot. Cover with lid and return to oven to bake for 30 minutes. After 30 minutes, remove lid from pot and continue baking, uncovered for 12-15 minutes. Remove from oven and allow bread to cool on a wire cooling rack. Check out those amazing crispy layers, and the inside of the bread is so soft and tender. What can I use to make no knead bread if I don’t have a cast iron pan? Make the dough as directed, including allowing it to rise. Shape the dough and place it on a greased baking sheet. Add one cup of water to a shallow baking dish and set it on the lower rack of your oven. The water will create steam which will help keep the bread crusty on the outside as it bakes. Place the baking sheet with the bread dough on the middle oven rack and bake for about 25-30 minutes. 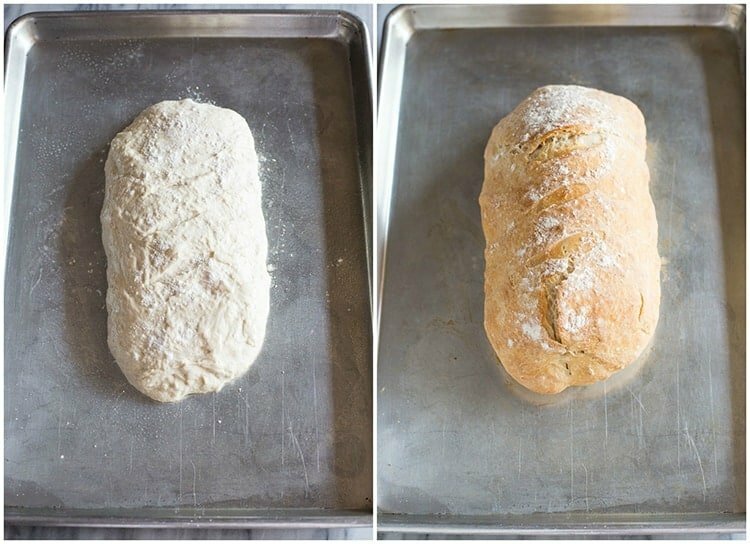 The result is the same delicious, crusty bread, and I love that you can really shape the dough any way you like when you use this method. I shaped mine into a log and I cut 3 very shallow diagonal slits in the top (optional). I felt like I was eating my own homemade version of a La Brea baguette! Can I substitute whole wheat flour? I’ve made this bread with success using half whole wheat flour and half white flour. I also stirred in 2 tablespoons of honey to the warm water. Make and bake as directed. Can you freeze no knead bread dough? Yes, you can also freeze the bread dough. Complete the recipe through step 4, wrap the dough ball in plastic wrap and place in a freezer-friendly container. Freeze for up to 3 months. When ready to bake, allow the dough to come to room temperature for 2-3 hours on the counter, or thaw overnight in the refrigerator. Continue with step 5 of the recipe instructions. What if you leave bread dough to rise too long? Once the dough has risen on the counter for at least 2 hours, or up to 18 hours, you can place a lid on it and refrigerate it for up to 1 week. Then continue with step 3 of the recipe. In a large mixing bowl, combine flour, salt and yeast. Pour in warm water and stir with a wooden spoon until well combined. The dough will be sticky, but that’s how we want it! Cover the bowl with plastic wrap and allow to rise on your counter, at room temperature, for 12 - 18 hours (I let it rise overnight). Lightly flour your hands and a work surface and scoop dough out onto floured surface. Shape the dough into a ball, the best you can. Sprinkle a tiny bit of flour on top of the dough ball and place it on a piece of parchment paper. Cover the dough lightly with plastic wrap. Place an empty cast iron pot, with the lid ON it, into the preheated oven (450 degrees) for 30 minutes. (IF YOU DON’T HAVE A CAST IRON POT, read above in the post for instructions to use a baking sheet). Once the pot is hot, remove it from the oven. Remove the plastic wrap off of the dough ball and carefully lift the parchment paper with the dough ball on it, up and into the hot pot. Cover with lid and return pot to oven to bake for 30 minutes. 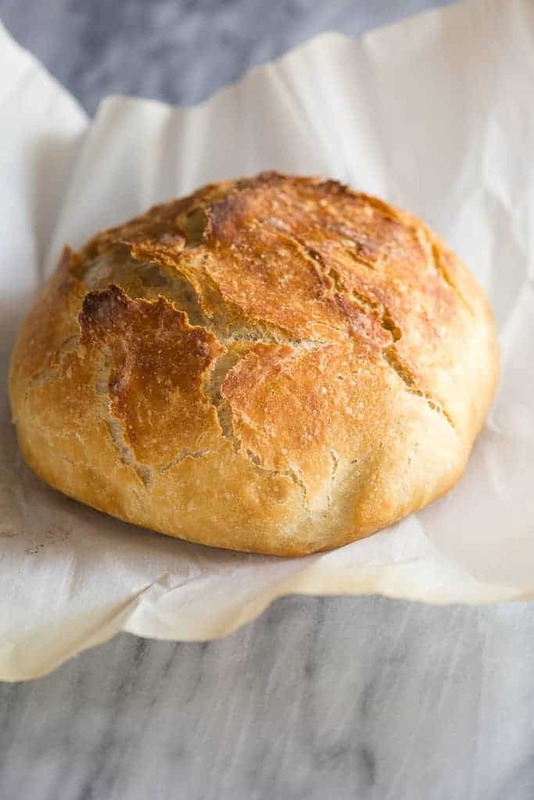 Store bread in an open paper bag, to ensure the crust stays crispy. 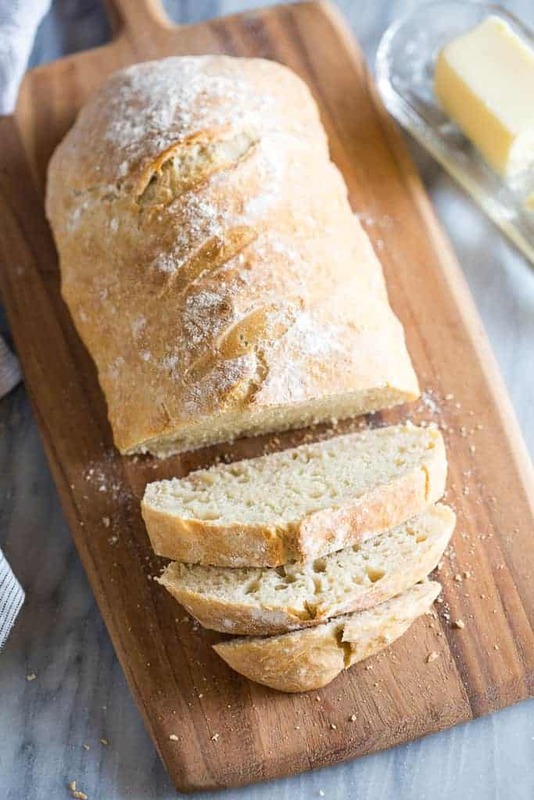 Store leftover bread on the counter for up to 1 week. Baked (and cooled) loaves of bread can be frozen for up to 3 months. *You can use regular salt, I just like the added flavor from the sea salt. Tips for freezing the bread dough are above in the post. I’m amazed at this recipe. Homemade bread is a little intimidating to me but I thought I would try it anyways. WOW! I feel l like a professional baker! Thanks for a great recipe with simple instructions. Thank you Anna! It really is such an easy and yummy recipe! I’m happy you tried it. Wonderful! It really is such a simple recipe–I’m glad you enjoyed it. Thanks for commenting! Amazing recipe! Bread came out perfect! Will definitely be making again and again! Thank you! I’m so happy to hear it! Thanks Catherine.